A teenage girl who appeared in court in a leopard-print dressing gown was refused bail after she admitted breaching her curfew. The 16-year old – who cannot be identified due to her age – became verbally abusive to the district judge who remanded her in custody, and was also violent towards prison staff. She appeared at Belfast Magistrates’ Court after breaching her curfew over the Easter holidays. 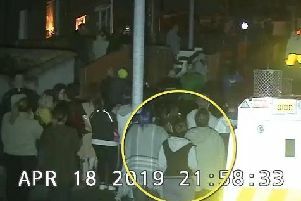 A police constable told the court that after being granted bail on a prior charge, the teenager was ordered to reside at a north Belfast children’s home, and to abide by an 11pm to 6am curfew. The officer said that as the girl did not return to the children’s home until just after midnight on Monday, she had breached the curfew condition of her bail. The constable also told District Judge Bernie Kelly that the teenager has already breached bail on seven separate occasions, resulting in seven warrants being issued. Opposing bail, the policewoman said it was her view the teenager “is likely to breach any bail conditions set by the court”. A solicitor acting on the girl’s behalf told Ms Kelly that at around 10.50pm on Easter Monday, the 16-year old called the children’s home to inform them she was unable to get a taxi for 11pm and would therefore be returning around 45 minutes late. Explaining why the girl came to court in her dressing gown, the solicitor said that when she returned to the home, she spoke to staff and went to bed, which is where she was arrested. The solicitor also said his young client accepted the breach of curfew, was fully aware she would be arrested and “realises she is testing the court’s patience”. An application for bail was refused by Ms Kelly, who said the teenager’s continued breaches suggested she has “clearly not got the message she cannot do what she wants when she wants”. Pointing out the underlying charge against the girl was an offence for violence, the district judge refused bail and remanded her into custody. At this point, the clearly enraged teenager launched an expletive-laden outburst and lashed out at prison staff as they removed her from the court. She is due to appear before the same court at a later date, via video link.